MANILA, Philippines – Gunmen claiming to have links with the Islamic State group threatened to kill hostages, including a Catholic priest, who were taken from the southern Philippine city of Marawi May 23. As of early morning May 25, nothing had been heard of the whereabouts of the priest and the prelature’s staff and some churchgoers who were taken captive. Cardinal Orlando Quevedo of Cotabato appealed to Muslim religious leaders to intercede with the gunmen, who claimed to be Muslims, for the safety of the hostages who were reportedly used as “human shields” when the militants attacked the city. “As the government forces ensure that the law is upheld, we beg of them to make the safety of the hostages a primordial consideration,” he added. Initial reports received by ucanews.com said Father Teresito Suganob, vicar general of the Prelature of Marawi, and several staff of St. Mary’s Cathedral, which was set on fire, were taken hostage. The gunmen also forced their way into the residence of Bishop Edwin de la Pena of Marawi. Bishop de la Pena confirmed reports that the attackers took Father Suganob, several of the prelature’s staff, and some churchgoers. He said he received a call from “a member of Islamic State” who used his kidnapped secretary’s phone and demanded a “unilateral cease-fire” in exchange for the life of the priest and the other hostages. Sending solidarity and prayers from the Archdiocese of Manila, the cardinal asked why anyone would hurt their neighbor. Archbishop Villegas said Father Suganob was performing priestly duties at the time of his capture. “He was not a combatant. He was not bearing arms. He was a threat to none. His capture and that of his companions violates every norm of civilized conflict,” said Archbishop Villegas. Fighters of the Maute group, which has vowed allegiance to the Islamic State, also burned several buildings, including the cathedral, a Protestant school and the city’s jail. The bishop said the gunmen used the hostages as “human shields” as fighting continued with security forces May 24. In Marawi, the military confirmed that five soldiers were killed and 31 others injured in the attack on the city. At least two policemen were also reported killed. Philippine authorities refuse to release the number of casualties and fatalities as “clearing operations” continued. Duterte placed all of Mindanao’s 27 provinces and 33 cities, roughly a third of the country, under martial law for a period of 60 days. Mindanao is home to an estimated 20 million people. Duterte warned that the martial law in Mindanao “will not be any different” from the martial law declared by former dictator Ferdinand Marcos. Ucanews.com reported that religious leaders and civil society groups, however, said there was no need for Duterte to put Mindanao under military rule. Filipinos have been wary of martial law since it was used by Marcos to remain in power for two decades, until his ouster in 1986. 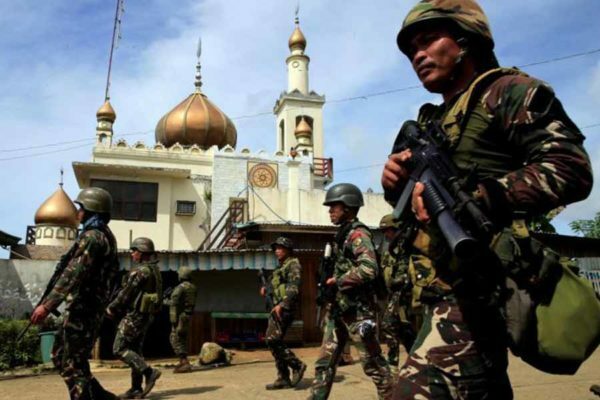 “Putting the whole of Mindanao under martial law is very dangerous and vulnerable to abuse,” said Alih Aiyub, secretary-general of the Ulama Council of the Philippines. “Fighting terrorism does not need the declaration of martial law, because our existing laws are more than enough to enforce it,” said Aiyub.